"I don't like to stay here while you are away. People will talk a lot of rubbish." Although Sergei Eisenstein gets the lion's share of the ink spilled on Russian silent cinema, there were of course quite a few other significant filmmakers creating interesting dramas on both large and small scales. This new disc produced by David Shepard's Film Preservation Associates features an intimate domestic drama by director Abram Room (1894-1976) from the end of the silent era. Husband and wife Kolya (Nikolai Batalov) and Liuda (Liudmila Semyonova) live in a Moscow basement apartment. Vlodya (Vladimir Fogel), an old war comrade of Kolya's, comes to Moscow but is unable to find a place to live. Kolya invites him to take the sofa as his kingdom. But when Kolya must go on a business trip, sparks begin to fly between Vlodya and Liuda, leading to tensions in the household of three and a shifting of allegiances between the various couplings. The acting is highly naturalistic, complementing Room's objective camera. The men have a childish character about them (emphasized by the use of diminuitives of the actors' own names for the characters), especially in contrast to the often oppressed life of Liuda. Even after the love triangle has become apparent, the men still treat each other as boys, playing checkers rather than attending to Liuda's needs. Liuda seldom leaves the basement apartment at all during the running time, emphasizing the trapped feeling that's made worse by Kolya's frequently contemptuous treatment of her. When Vlodya, in an attempt to spoil her a bit, takes her for a brief airplane ride, the exhilaration and freedom introduced into her life is palpable; even though she earlier demonstrated dislike for him it's easy to see why he begins to appeal to her. The relationships develop in an unforced and credible manner. The visuals are engaging throughout, with a good deal of the use of mirrors and blocking of characters to emphasize mood and the narrative thrust. Indeed, there are very few intertitles and few are needed, as the visual storytelling is more than enough to carry matters along. The triangle is often depicted visually as well, with the two men onscreen while Liuda's picture on the wall hovers between them. When matters reach their head, Liuda significantly removes the picture from the frame and places it back on the wall, signalling an abrupt change in the relationship, this time for good. Image Transfer Review: The original full-frame picture is presented in a slightly windowboxed manner, so little or none of the visual information is lost to overscan. The source print has the expected flicker, noise, speckling, and occasional splices, but it's obviously early-generation source material since it has a good deal of detail and texture present. Black levels are very good and a nice range of greyscale is present. As a whole, it's quite attractive for being 75 years old. Audio Transfer Review: The Mont Alto Orchestra provides a chamber score for the film, and it's quite appropriate, with a nice Slavic feel that's not overwhelming in character. Directionality is surprisingly clear, with excellent depth and presence, especially from the cello. Extras Review: Not a great many extras are provided (in addition to the Russian version of the feature), but they're excellent. First up is a full-length commentary by Julian Graffy, a professor in Russian literature and cinema in London and author of a book on the feature. Not only are his credentials impeccable, but he points out numerous facets that might not be obvious to a non-Russian audience and explains the geography, which is important to the working of the film. Although he occasionally stoops to narrating what's onscreen, the main drawback is poor, echoey sound that makes it a trifle difficult to listen to. The other principal extra is the short film Chess Fever (Shakhmatnaya goryachka, 1925), a 27m:46s comedy about the chess mania that overtook Moscow during that year, when it played host to the International Chess Tournament. Vladimir Fogel returns here as a young man obsessed with chess and about to marry Vera (A. Zemtsova). His disregard for the pending nuptials in favor of the chessboard sends Vera into a frenzied rage and she does everything she can to get him to pay attention to her. The comedy quickly hits absurd heights and is very funny, particularly in depicting the maniacally absorbed public that lives for the game of chess. One doesn't usually associate the Russians with comedy, but this film proves that they're quite capable of it when the mood strikes. Longtime champion Jose Capablanca makes an appearance as well, so chess history buffs will be interested for that feature as well. Judith Mayne also provides a spoiler-filled set of notes that are best read after viewing the film. 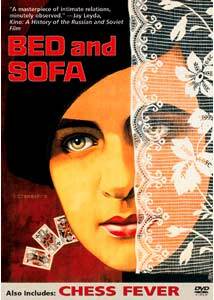 Domestic drama and the ménage à trois, Soviet style, but without the Party line being toed. The transfer's quite good and there are some outstanding extras, making it another set silent film fans will want to have in their collections.